As the December 18th release date of the Star Wars movie The Force Awakens draws nearer, additional details about the highly awaited movie are being brought to light. On Monday, the movie’s director, J.J Abrams appeared on The Tonight Show and revealed that a cantina scene would be included in Episode VII. It would bear a strong resemblance to the beloved A New Hope sequence and the scene boasts music that he wrote with the collaboration of Lin-Manuel Miranda, the mastermind behind ‘Hamilton’, which is Broadway’s hottest show. 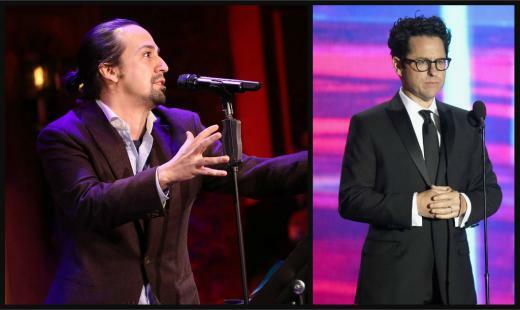 Abrams revealed to Jimmy Fallon that he had gone to a Hamilton matinee and had had a chance meeting with Miranda where the latter had offered his services jokingly for making the music of the cantina scene. Miranda hadn’t known then that John Williams, the legendary composer of Star Wars had requested not to make music for that scene in the movie. The director said that he ended up emailing Miranda and said that he knew it was a joke, but he was working on something and Miranda could help him if he liked. Abrams said that Miranda was ready to jump at the chance and drop everything. He broke his tirade by telling Jimmy that he had seen Miranda on his show and it was the best television he had seen in the last decade. Then he went back to the story and said that they had sent music files back and forth where Miranda had played instruments and sung. Now, one sequence in the movie boasted music written by the two. The collaboration was confirmed by Miranda via a tweet in which he said that he had been working on the music for the past 2 months and was really excited to see it. During his appearance on the Tonight Show, Abrams also confessed to Jimmy that he had nearly broken his back in trying to prevent Harrison Ford from breaking his leg due to an accident on set.